Before i start, i have to first clarify that i'm not here to teach you how to catch your spouse cheating. There's no need to, anyway, because there's a whole lot of services out there that specially caters to this. In fact, this whole cheating spouse thing is such a big business til they can afford to advertise almost anywhere! Billboards, newspapers and even taxis! Especially Singapore. 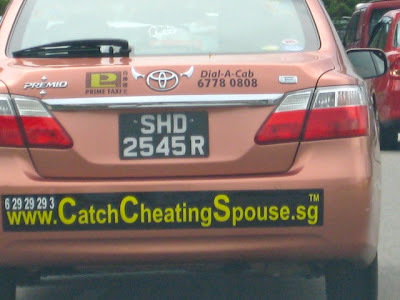 I guess there must be quite a number of cheating spouses in Singapore for them to afford advertisements like that. Or people living in Singapore are just too insecure about their marriages. It's such a sad thing, isn't it. So much for being together through sickness and health, wealth and joy, to cherish each other and til death do we part. Nothing but empty promises and mere words. Why get married in the first place when you can't even stay loyal to the person you supposed "love"? Oh well, i guess this is one of the by product of modernization. Who knows? Maybe in the future, there will be a different kinds of catch cheaters business with the way our world is going. Maybe something like catch-cheating-children or catch-cheating-parents business. You'll never know right. Perhaps your parenting skills are not that up to par, or you're unable to shower your kids with expensive gifts til they have no choice but to find someone who have no children and can give them with whatever they want. Like Angelina Jolie, for example. What a wonderful world we have. I think that this behavior is deeply rooted in evolution. I mean women were more likely to survive with a "strong man" in the wild. I think that it is possbile to be "strong" and attractive with being a "bad boy." I think this is the perfect combination - however rare.